Fathiah Zakham studied tuberculosis in Yemen until a bomb destroyed the university where she was working. Through the Scholar Rescue Fund, she received safe haven in Helsinki, Finland, to study. Scholars and scholarship are generally endangered in authoritarian countries and in war zones. Fortunately, there are activists determined to keep the search for truth alive among all nationalities. The Scholar Rescue Fund was established to place refugee scholars in safe institutions where they can continue their work. Even in today’s isolationist America, refugee scholars are getting a future. Deborah Amos reported on international placement efforts at National Public Radio (NPR) last fall. “Around the globe, more scholars are now threatened and displaced than since World War II began. In response, U.S. universities have sponsored endangered scholars and recently created a consortium that offers a broader academic community to refugee scholars threatened by war and authoritarian governments. “The Scholar Rescue Fund, established in 2002, has helped more than 700 scholars find academic placements in 43 countries. About 40 percent have been placed in American educational institutions. “Indian activist and academic Binalakshmi Nepram says her work advocating for gender rights and a women-led disarmament movement in her home state of Manipur, in northeast India, led to threats and intimidation. … Now she is a visiting scholar in residence at Connecticut College. ” ‘We have all left everything behind,’ she said. … Her placement in Connecticut is a lifeline. She has continued her activism, giving a recent lecture on how the women of Manipur state worked together to confront violence in a decades-old armed conflict between insurgents and the Indian military. An Alwan radio producer in the station’s recording studio. The broadcast lifeline to Syria is located in an apartment complex in Turkey. Where people struggle to carry on their lives in the midst of war, radio can provide comfort and hope. This is a story about Syrians in exile who broadcast news and normalcy to people back home. “Sami [has] a philosophical approach to the objective of radio itself. At National Public Radio, Rachel Martin reported recently on Music in Exile, an initiative that is providing a certain comfort to displaced musicians and other refugees. “One of the musicians featured in the project is Barakat Ali, a Yazidi man who fled from ISIS attacks on his home of Khana Sor. He says the past few years have changed the way he approaches music. “Hear the full interview at the audio link,” here. I wish I could learn about these unfamiliar cultures through less tragic events, but I do like to learn something new. A colleague at my old job enlightened me about his Assyrian relatives, who were suffering the same dangers as the Yazidis at about the same time period, 2015. 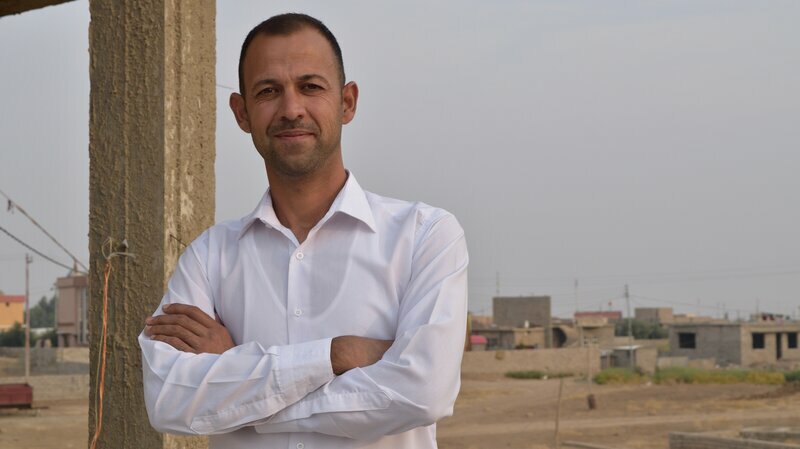 Barakat Ali is a Yazidi refugee and musician who has contributed to the recording project Music in Exile.